"My foundation remembers those who have given their lives to our great country. With support from USA Medical Card, our group has been able to expand our work with our nation's disabled heroes," said Mitch Serlin, Founder and President of Hope For Heroes. "Every day, my foundation remembers those who have given their lives to our great country. With support from USA Medical Card, our group has been able to expand our work with our nation's disabled heroes," said Mitch Serlin, Founder and President of Hope For Heroes. "We have been able to help servicemen and servicewomen heal and experience the personal accomplishment that can come from participation in our programs." "It is a great honor to be working with Hope For Heroes and making a difference in the lives of the nation's heroes. 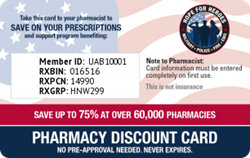 Our program helps people save money on prescriptions while helping wounded heroes restore a healthy, active lifestyle," said USA Medical Card Co-Founder and President Jordan Sessler. "This sponsorship will help ensure more funds are available to help strengthen a community of hope and healing."